Sunward Patio believes in creating products that are not only functional and innovative, but products that also give back. With the Sunward Patio Raised Garden Bed, you get the best of both worlds. With its durable Western Hemlock construction, you can trust that this garden bed will last for years to come, while providing a sustainable source of nutrients for your family! 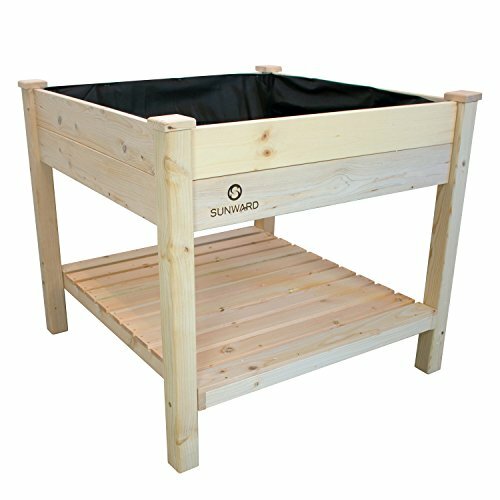 This raised garden bed kit measures 36"L x 36"W x 32"H. This Garden Bed also features a raised shelf underneath the planter bed for the storage of your gardening tools and accessories or use it to hold other small planters as well. The tool-less construction of this garden bed kit makes assembly a breeze! No tools or drills needed, just simply slip the panels into the slip joints in each leg and enjoy! (The bottom shelf does require four included bolts to be installed to support the shelf). We have also left this elevated garden bed unfinished so that you can add your own personal touch to the style of your garden bed. Either use a nice polyurethane sealer to protect the natural finish or paint it your favorite color to fit in with the rest of your outdoor accents. Whatever your gardening needs are, rest assured that Sunward Patio will have you covered. Don't wait a second longer to get your summer garden going, purchase your Sunward Patio Raised Garden Bed today! CONVENIENT raised garden bed construction makes planting, watering and harvesting simple and effortless. DURABLE Western Hemlock material is sure to last for years to come! CUSTOMIZABLE unfinished material gives you the opportunity to add your own personal touch to this raised garden bed kit. If you have any questions about this product by Sunward Patio, contact us by completing and submitting the form below. If you are looking for a specif part number, please include it with your message.